My interest in CrossFit was inspired by my husband, Bill Russell. Together, we co-founded CrossFit Cleveland in the Spring of 2007. Not having been a previous athlete, I had much to learn. I originally got my Level 1 Training Certification in the Spring of 2008 and re-certified in 2011 and 2016. In addition, I am CrossFit Gymnastics certified, CrossFit Mobility certified, CrossFit Kids certified and in March 2013 earned the USAW Club Coach Level 1 Certification in Olympic Weightlifting. I am also a Precision Nutrition Level 1 Coach and certified in CPR. My background is in the court reporting profession. I formed Northeast Court Reporting, Inc. in 1996 and have owned and operated it ever since. I’ve been a hands-on owner since day one, and CrossFit has been no different. Knowing the east side of Cleveland was in need of a CrossFit location, I co-founded Great Lakes CrossFit in November of 2010 with business partner Patrick Flannery. I have been training and coaching CrossFit and am in the best shape of my life. I believe in the CrossFit methodologies and strive to help “ordinary” people, like myself, look and feel better, and gain confidence in themselves they didn’t know was there. Bill first received his CrossFit Level 1 training certification in April 2007. After a 30 year career in the computer services industry, he now spends all of his time operating CrossFit Cleveland with his wife Staci and gym mascot Jessie. Bill holds a 2nd degree Black Belt in Korean Hapkido, earned through 8 years of training starting at age 39, under 7th Dan Master Michael Mignona and 4th Dan Master Chris Price. Bill has attended four CrossFit Level 1 Certification Seminars since early 2007, two of which were taught by Coach Greg Glassman and Nicole Carroll. He has also successfully completed the CrossFit Gymnastics Certification, Mobility Certification and Powerlifting Certification and Strongman Certification Seminars, as well as the USAW Club Coach Level 1 Certification (Olympic Lifting). The recommendation of a Marine Recon officer and a traffic accident on I-90 were the happy combination that led me to Crossfit Cleveland of Lakewood in December of 2010. One free Saturday class was all it took to get me hooked. I’ve been wodding with Bill and Staci ever since, and I completed the Level 1 Trainer’s course in early 2013. As a high school math teacher at St. Ignatius, I love having a job where I learn something new every day and get to help a great group of kids do the same. I’m also a lifelong tennis player and have coached for the past 20 years — I love competing, setting goals, and making measurable improvement, and I get a real kick out of seeing others improve and achieve their own goals. Crossfit provides a perfect platform to pursue all of these — lifelong learning, goal-setting, goal realization, continuous and measurable improvement, and competition. Introducing Crossfit to others and helping them in the box has been a blast. Beyond that, the workout variety and people in the box are just really fun. Prior to Crossfit, I had never stuck with a workout routine for more than two weeks. Since 2010, I haven’t missed more than two days, and I’m excited every time I head to the box to see the challenges and suffering that await. When I’m not teaching, coaching, or plodding through WODs, you’ll find me playing table tennis with my son Ian, (or, perhaps, bribing him to work some more math problems), or pestering my wife Francisca for back rubs. The final member of our family, Momo, doesn’t do Crossfit, but only because they don’t offer it for dogs. 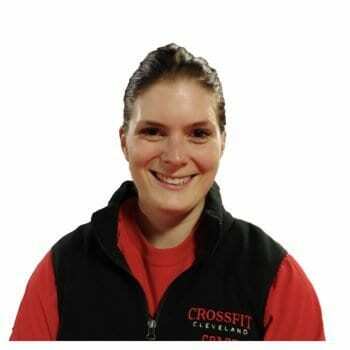 Cara is a CrossFit Level 1 Trainer as well as Certified Personal Trainer through National Exercise Trainers Association. She has her Bachelors in Human Performance and Health with a Masters in Occupational Therapy specializing in geriatrics from West Virginia University. Cara competed for West Virginia University on the Cycling Team and the Equestrian Team assisting in bringing home numerous team and individual conference championships as well as holding two WV State Cycling Championships while signed onto the Dynamic Physical Therapy Cycling Team powered by Pathfinder during her time there. Cara is currently racing for the Summit Freewheelers in gravel and cyclocross events and continues to ride her horse, Hope in her free time. Cara also has two rescue pups, Tbone and Isabel, with her fiance Josh. Randy runs our Rocky River Fitness Kickboxing classes. He has a Black Belt in Tae Kwon Do as well as several championship titles in competitive sparring tournaments around the country. Randy also owns and operates PowerKick, a fitness training company specializing in helping athletes improve their fitness levels. Randy is credited with helping our very own Bill Russell lose over 30 pounds during the beginning of his martial arts training in January-March of 2000.